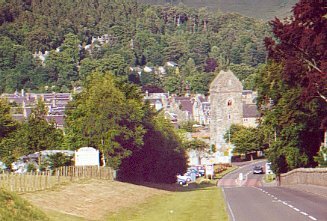 This small town is located 23 miles (37 km) south of Edinburgh and 18 miles (29 km) west of Galashiels in the old county of Peeblesshire at the junction between the Eddleston Water (the Cuddy) and the River Tweed. One of Scotland's royal and ancient burghs, Peebles was a major centre for brewing (18th Century) and wool production (19th and 20th centuries) while today it is a market town and holiday resort with fishing, golfing, tennis and pony-trekking. It remains a bastion of the independent shop. The town has three primary schools and Peebles High School is the largest secondary school in the Scottish Borders, with a roll of c.1400 pupils (2012). Kingsland Primary School occupies a new £8,5 million building, which was recognised as the Best Educational Building Design in Scotland in 2011. Peebles Rugby Football Club was founded in 1879 and the Beltane Festival (which includes the Mediaeval tradition of the Riding of the Marches, revived in 1897) is held in the third week of June. Peebles was formerly the headquarters for Tweeddale District Council (1975-96). The castle which stood here was used as a royal residence and hunting lodge by King Alexander III who also founded the Cross Kirk (1261), which became a Trinitarian Friary and eventually the parish church. Its successor is Peebles Old Parish Church (1877), at the western end of the High Street. St. Andrew's Old Parish Church (1195) was damaged in the wars with the English (1545) and the town was later burnt in an accidental fire in 1607. Cromwell's troops quartered here in 1656. Notable constructions include the red sandstone Peebles Hydropathic Hotel (1878-81) - popularly known as the 'Peebles Hydro'; the elaborate Chambers Institution (c.1859, now including the John Buchan Story); the Mercat Cross (14th century); and the Tweed Bridge (15th century). The first railway line reached Peebles in 1855, which developed as a junction from 1864. There were once three railway stations; the Old Station (which became goods sidings from 1864), Peebles New or East on the North British Railway, which closed in 1962, and Peebles West on the Caledonian Railway, which closed to passengers in 1950 and to goods nine years later. A paved multi-use path now extends east along the line of the former railway to Innerleithen. Peebles is now reliant on road transport, lying at the junction between the A72 and A703 trunk roads. Born here were the publishers and brothers William and Robert Chambers (1800, 1802), and John Veitch (1829), philosopher, poet and historian; the explorer Mungo Park lived here for two years before leaving on his final trip to Africa; and visitors have included King James I, poet James Hogg, authors Robert Louis Stevenson and John Buchan, and Queen Elizabeth II.